The Grossmont Healthcare District presented the eleventh annual Healthcare Heroes award at the Steele Canyon Golf Club. 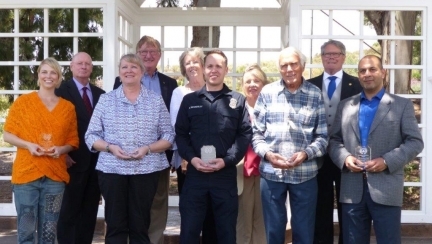 The Healthcare Heroes award are meant to be given to the unrecognized volunteers who assist in health care in San Diego’s East Region community. This year’s honorees included a camp counselor with a big (and new) heart, a woman who drives seniors to doctor appointments, an 83-year-old man who remains at the bedside of dying hospital patients, a new U.S. citizen from Iraq who helps newly arriving refugees understand the U.S. healthcare system, and a 17-year-old who oversees other youth junior volunteers at Sharp Grossmont Hospital.